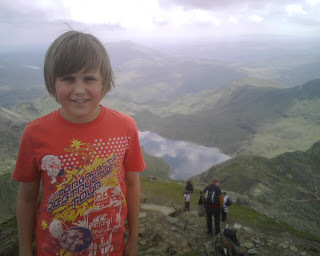 This Blog entry comes from me and Jacob at the top of Snowdon. One heck of a climb but the views are magnificent and the weather is great. For those interested we came up the Pyg path and are going back down the Miners path, having stayed in Pen-Y-Pass youth hostel last night. Its great spending time with Jacob - I love being a Dad - even though it does have its moments sometimes! On that subject be thinking who to invite to our Fathers Day morning guest meeting - Wii Love Dads - and whether you want to nominate anyone for funniest, most embarrasing or best Dad of the year. Hope to catch you this weekend. you are now at one of my my favourite places on this Earth. First time i climbed Snowdon was with a friend from the methodist church in Wokingham when i'd been volunteered by a mate of mine for the three peaks challenge. we were raising funds for caritas, the charity for wokingham youth homeless. they'd built the caritas centre but had no funds left to kit it out. So John., an elderly seasoned climber, took Nick (my mate) and I to the top of Snowdon via theKNIFE RIDGE for an introduction to mountain trekking.. Scary. Scary. Scary. lives up to its name. Anyway, we survived and decided that the three peaks would not be so bad after all. thanks John for your guidance and for joining us on the challenge where we raised enough funds and product donations to open the Caritas centre. And Snowdon was the final mountain on the challenge, with the sun out and no knife ridge this time. The perfect end to a enduring yet enjoyable weekend. See you Sunday i hope. Jacob and I thought briefly about doing the knife ridge but decided against it - maybe next time! maybe one day we could all do a kerith community climb.